March Madness of Phones: Droid vs. Hero – Vote Now! OK, it’s time for the Droid Life community to take over and dominate a poll. 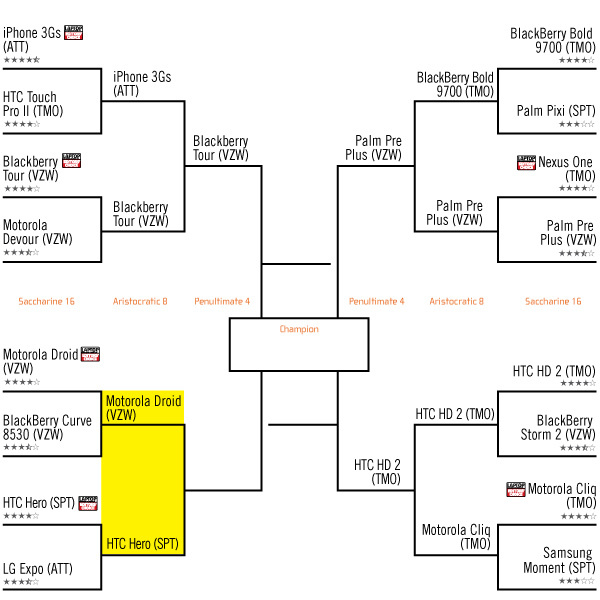 Laptop Mag is running a March Madness styled contest for mobile phones and the current round has the Motorola Droid paired up against the HTC Hero. Shouldn’t even be a question as to the better phone right? Well, early results on their poll have the Hero off to a slight lead. You kidding me? Let’s do the Motorola Droid justice and all head over there now and vote for our favorite device. Bring the heat! The poll closes tomorrow morning at 9AM EST.